Developed and field tested by military and law enforcement, Quick Draw is the only holster lubricant specifically designed to give you an ultra-fast draw from the holster while also protecting the firearm, and breaking-in or conditioning your holster. Just one spray creates a thin lubricating barrier between the holster and firearm that provides you a smooth, therefore faster draw of your weapon. It speeds the draw by reducing friction. It also protects your holster and firearm from abrasion, scuffing, corrosion and rust which may otherwise be an effect of the rigorous training and competitions that your gun and holster endure. Quick Draw lube is a precise ratio of viscosity optimized silicone and lanolin. There are numerous kinds of silicone, each with viscosity ranging from thinner than water to thick grease. Quick Draw was perfected by testing a range of silicone types and viscosities to create the perfect lubricant for drawing a handgun from modern snug holsters. 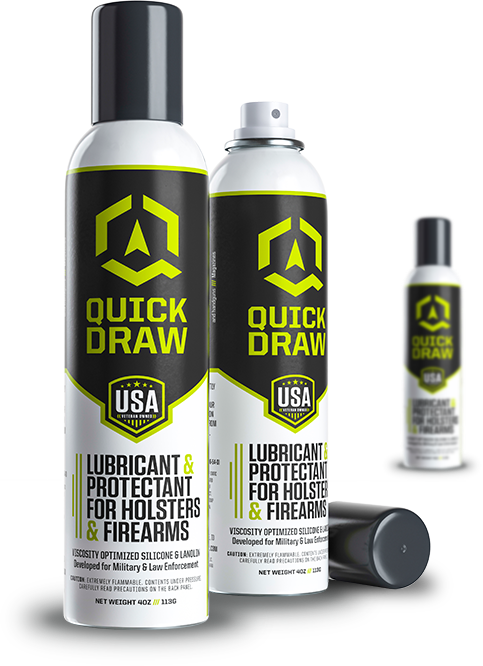 In combination with lanolin, Quick Draw creates a thin lubricating and protecting layer of silicone, while the lanolin penetrates to protect the gunmetal and holster.